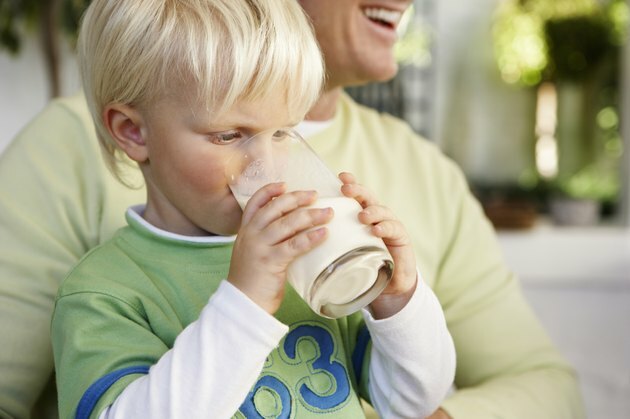 Dairy products, such as milk, yogurt and kefir, offer many health benefits. According to the USDA, consuming diary products has been linked to improved bone health, a reduced risk of cardiovascular disease and type 2 diabetes and lowered blood pressure. If you are lactose intolerant, choosing cultured forms of dairy might be more preferable because most or all of the lactose is consumed by the cultured yeast and gut-friendly bacteria. Milk, yogurt and kefir all offer high amounts of calcium, potassium and vitamin D. Calcium helps your body build strong bones and teeth, and aids in maintaining bone mass. Potassium promotes healthy blood pressure by improving kidney function, reducing the chance of blood clots and keeping the blood vessels open. Vitamin D helps your body maintain proper levels of calcium and phosphorus, required to maintain healthy bones. 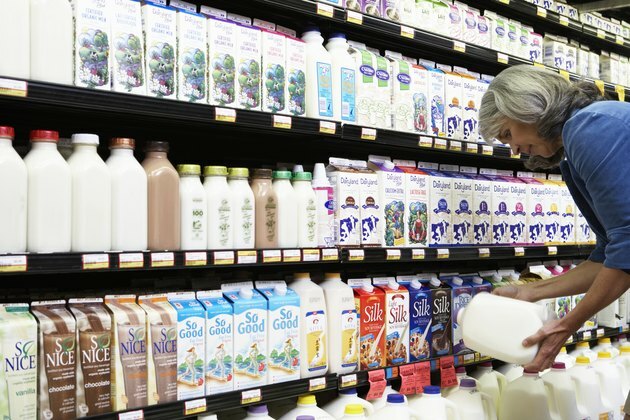 To gain all of the benefits that milk has to offer without consuming too much saturated fat, the USDA recommends drinking low-fat or non-fat varieties. For example, one cup of two-percent milk contains only 125 calories while offering 8.53 grams of protein, 4.7 grams of fat and 12.18 grams of carbohydrates. It also offers a whopping 314 grams of calcium, 397 grams of potassium and 98 grams of vitamin D.
According to US News, not all yogurt is processed the same. 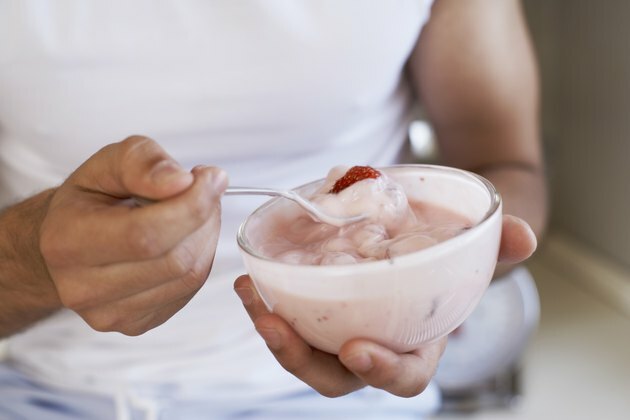 Compared to standard yogurt, Greek yogurt is strained to remove most of the liquid whey, lactose and sugar, which gives it a thicker, creamier consistency. Providing the same amount of calories and gut-healthy active cultures, Greek yogurt offers double the protein and half the sugar, making it an attractive option over standard varieties. In fact, a 6-ounce serving of non-fat plain Greek yogurt offers 100 calories, 17.32 grams of protein and only 6.12 grams of carbohydrates. In this same serving, you get 187 grams of calcium, 240 grams of potassium and plenty of active cultures that may include one or more of the following: S. Thermophilus, L. Bulgaricus, L. Acidophilus and Bifidus. If you are lactose-intolerant, you might want to give kefir a try. The lactose is consumed by the gut-friendly bacteria and yeast during the fermentation process. This cultured, enzyme-rich food is a slightly healthier choice over yogurt because it provides a complete protein, essential minerals and is a good source of B vitamins. 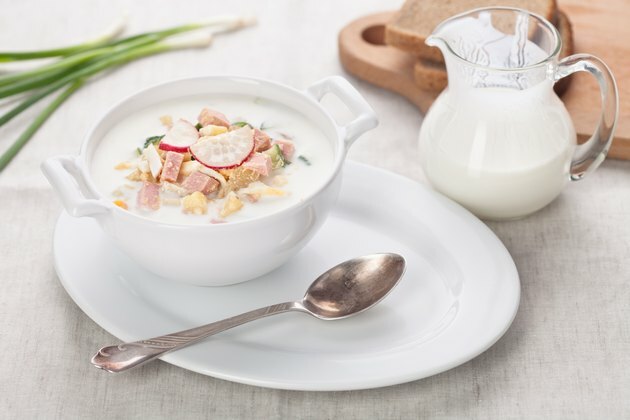 Unlike yogurt, which contains transient beneficial bacteria, the bacteria in kefir colonizes the intestinal tract, making it an excellent choice for those who have been on antibiotic treatments, or suffer from immune disorders. According to Jillian Michaels, the health and wellness expert, 1 cup of traditional plain kefir made with whole milk contains 150 calories, 8 grams of fat (5 of which are saturated), 12 grams of carbohydrates and 8 to 11 grams of protein. To reduce the amount of fat and calories, consider drinking the low-fat varieties. US News: Greek Yogurt Vs. Regular Yogurt: Which Is More Healthful?